As we walk with God, putting our trust in Him, we can have peace and perspective in hardships, trials, suffering, and struggles of any kind. We can rise above. Jesus not only speaks about trouble in this world but also presents hope for both the future and for right now. Let’s take a look at what Jesus said. Jesus presents a realistic view of trouble. Jesus presents hope in the midst of trouble that should minister to our inner being. Jesus presents a better future that should affect how we handle trouble today in this world. Praise God a better day is coming! 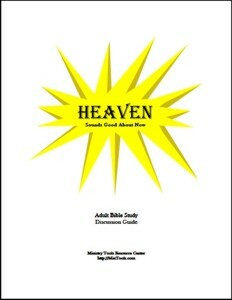 Order the Heaven Sounds Good About Now Discussion Guide for personal study, your small group, or adult Sunday School class. These studies challenge us to live NOW like we really believe what Jesus said. When we do, though trouble surrounds us, it can be well in our souls. Why? Because we are trusting in Him. Heaven is more than a future home! It is a hope that affects us now, in our present reality! Heaven does sound good about now! In times of pain and loss, we most need comfort, peace, and hope. Yes, we might want tangible help, healing, and restoration but that doesn’t always happen right away. We need that which will help us walk through the valleys of life no matter how long it might take. Check out the Walk the Walk Even When It Hurts Devotional for thirty devotions from Psalm 23 pointing to the Lord as your Shepherd who provides what you need to make it through even the shadow of death. We can try to pull ourselves together but sometimes we are so emotionally wrung out, mentally exhausted, or physically depleted that we have little reserve to pull on. Perspective can become skewed when we hurt and we could lose all sense of hope. We can wait for our circumstances to change but sometimes life gets worse rather than better or the change isn’t as we thought it should be. Prospects of a better life can allude us and so we become more anxious rather than finding a sense of peace and contentment. We can expect other people to come to our rescue but sometimes they seem blind to our pain or fail to consistently show the compassion and understanding we need. Problems can be compounded by additional hurts from people we thought would be there for us and so we lack any sense of comfort. We can’t rely on self, circumstances, or others. But, there is One who can give us what we truly need when we hurt — God, who is the God of all comfort, peace, and hope. Even when we find comfort from other people, it’s because of God. He is the ultimate source of comfort. God designed the Body of Christ to be there for one another in both the ups and downs of life, the joys and the sorrows. But, the Church is composed of imperfect human beings incapable of consistently showing unfailing love and compassion. Only God can be counted on at all times and in all circumstances. Let Him use other people through your grief and pain, but put your trust and ultimate reliance in Him for the comfort you need. We can’t dwell on our negative circumstances and expect to have peace. We won’t feel good when we dwell on the bad. When, however, we turn to the Lord who is good and works for our good, we can find rest for our souls in Him even when circumstances remain unchanged for He is the God of peace. When we come to the realization that we can’t fix what’s wrong in this world, albeit even in our own lives, but that there is Someone who can and will one day right the wrongs, we can experience hope. We can believe God’s good purposes will prevail no matter what happens. Persevering in our suffering lets us experience God in a way we otherwise would not know. It puts us in touch with the God of all comfort, peace, and hope — who is sufficient to help us when we hurt. Have you ever cried out to the Lord with feelings similar to the Psalmist? By the time we get down to verse 30 of that Psalm, after rehearsing and assessing of his circumstances, we find him rising above in praise and thanksgiving. How Can We Rise Above Our Circumstances? Perspective about this life helps us adjust expectations. “But I pray to you, LORD” (v. 13). He doesn’t deny the reality of what’s happening. Nor does he blame God or express that he shouldn’t have to experience these things. Rather, He turns to God. Promises based on the character of God help us regain hope. If we read through the entire Psalm 69 we notice hope beginning to take hold as the Psalmist speaks of God’s “sure salvation” or deliverance (v. 13, 29). He remembered how the Lord “hears the needy” (v. 33). He trusts God to answer him, to keep His promises, out of the goodness of His love and great mercy (v. 16). We too, in Christ, hold on to many promises that grow out of the character of God and let us know we can be overcomers (1 Jn. 5:4-5). In this we can find hope in the midst of great difficulties when we believe that the One in us is greater than any other (1 Jn. 4:4). Purpose founded in who we are in Him helps us look at the bigger picture. In Psalm 69 we see the Psalmist go from what was happening to him personally to how God is there for all the poor and needy (v. 32-33), and then a call for the “heaven and earth” to praise God, even “the seas and all that move in them” (v. 34). He was able to move beyond his own troubles and needs because he knew what he experienced wasn’t the end of the story. As a Jew, the Psalmist knew God had a plan for His people, a future restoration (v. 35-36), which in itself was cause to rise above the muck and mire of this life. As Christians, we know God has a future plan for us, a home in glory with Him where there will be no more suffering, no more tears. And so, we learn to set our “minds on things above, not on earthly things”, to view life from our position in Him (Col. 3:1-2). With a realistic perspective on life, we cling to God’s promises and find purpose based on who we are in Him and what He is yet to do. The troubles of life begin to pale in comparison and we find ourselves able to rise above. We live in turbulent times. We face many unknowns. The kind of strength and courage we need won’t come from within. Nor will we find it in our circumstances. We need the strength and courage Joshua, of the Old Testament times, needed as He faced many unknowns, seeking to lead a rebellious people. 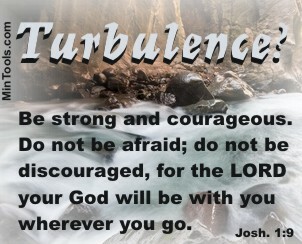 Need strength and courage? Though our circumstances may differ from Joshua’s and all the particular promises and precepts God gave him may not apply to us, we nonetheless serve the same God. In the midst of trials and hardships we can still have joy — purposeful joy. While it may be difficult to imagine such joy when surrounded by so much turmoil, it is possible. 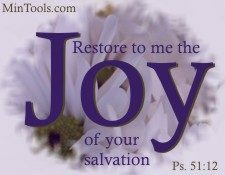 If we look at Bible verses about joy, we find some tips for attaining and keeping this joy in our hearts. 1) Accept that there’s a bigger and better picture than what’s happening in the moment. 2) Focus on God’s history of faithfulness to His people … and to you. 3) Bask in God’s presence. 4) Focus on the Lord and what He can do rather than your circumstances. 5) Yield yourself to the Holy Spirit to produce this joy in you. — That which might seem humanly impossible is possible with Him. 6) Pray that God would enable you to let go of that which is keeping you from His joy. What is purposeful joy? No, it’s not a term used in the Bible but I believe the concept is there, specifically in James 1:2-4. First, notice how we are to “consider it” joy when faced with trials. That’s a purposeful choice to let joy reign in our lives, not our circumstances. The Greek word for “consider” (hegeomai) literally means to lead or go before, to have rule or authority over something. That means we don’t let our circumstances control us or pull us down. Instead, we choose to rise above by gaining perspective. We deem, or think about, our circumstances as joy — not just a glimmer of joy but “pure” joy. A better rendition for “pure joy” would be “all joy” as the Greek word (pas) means all, individually and collectively — complete. Second, notice the reason for considering it joy when faced with trials. 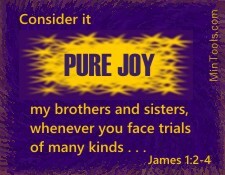 Trials have a purposeful outcome which give us a reason to grab hold of joy in adverse circumstances. By looking at the big picture, that of the character trials build within us, we’re able to gain the perspective we need to choose joy. Persevering in hardships not only produces mature character but also leads to a sense of contentment in which we’re “complete, not lacking anything”. If we allow our circumstances to rule us, rather than considering them pure joy, we won’t arrive at this outcome. Third, notice the expectation of life to not always be easy, filled with only “feel good” moments. “WHEN” not “IF” trials come, we can be prepared by having a purposeful plan already in place to combat human tendencies. Jesus told us to expect problems when He said, “In this world you will have trouble” (Jn. 16:33). God uses His Word to prepare us. If we’re Bible illiterate, it’s going to be difficult, in the midst of trials, to grab hold of the perspective we need to purposefully choose joy. However, when we’re familiar with verses like James 1:2-4, we will be more likely to head in the direction of joy over despair, to let joy reign in our lives rather than our circumstances. We will need purposeful joy because it won’t come naturally. In the next post we’ll look at other Bible verses that show how this kind of joy is possible!